Every Mumbaikar knows the meaning of, ‘Cutting Chai’. For the rest of the world, a cutting chai means half a cup of tea that is cheaper than a full cup’ yet enough to get refreshed. Now Livpure has started a campaign #CuttingPaani to spread awareness about the rising shortage of potable water globally. #CuttingPaani means if thirst is little, then drink only half a glass of water. A small but impactful campaign to make each person responsible to take steps to preserve drinking water. When one hears of the water crisis, the first picture that comes to mind is of the viral news of the water shortage in Cape Town. A city with 4 million people provides just 50-litre water per day for a person. In the US a person gets 350 litres of water per day. And very soon, a ‘zero-day’ will arrive in Cape Town when one million households in the city will not get any running water. What is happening in Cape Town, is a bleak story of what every city in the world can expect. Interestingly, one reason for the water crisis according to reports is ‘poor water management’ and ‘insufficient preparation’. We fear there will be Zero-day in Bengaluru. According to reports if the rainwater is harvested properly, the water crisis in Bengaluru can be managed. Which means if we manage our water we can avoid the zero-day. #Cuttingpaani is the first initiative in the direction of saving water. We can save water by #cuttingpaani in a number of our activities at home. One must drink 3 to 4 litres of water in a day. But the majority should be consumed in the daytime. Having more water in the night may lead to kidney and other ailments. You might have indoor plants, outdoor plants and kitchen gardens at home. Some plants like Cactus family and aloe vera require very little water. Some plants and soils require water only to be sprayed. Keep only those plants at home that requires hardly any water. For bathing use bucket and mug. For brushing and shaving use water in a mug. Wash dishes by taking water in a small basin. Avoiding tap water usage directly saves a lot of water. Handwashing requires only that much water as is required in the first round of washing in a washing machine. For a washing machine, at least 12 to 15 buckets of water is for three rounds – one washing and two rinsing sessions. Whereas in hand wash the whole activity will be over in 3 buckets of water. A common view in Indian cities is to see hose pipe with running water being used to clean veranda. Mostly maids just waist the water pouring the water on all the vehicles, plants, gates and so on. Using a hosepipe to clean is an easy but a water wasting method of cleaning. Mop the veranda floor to save water. If we use our resources more reasonably and more collectively we can avoid a zero-day. Also, sing the petition for #CuttingPaani to spread the awareness to fill the glass with only as much water as you have thirst. Watch the video to know more about the campaign. There was a huge crowd at the Greater Noida Auto Expo 2018 on the first day for the public. 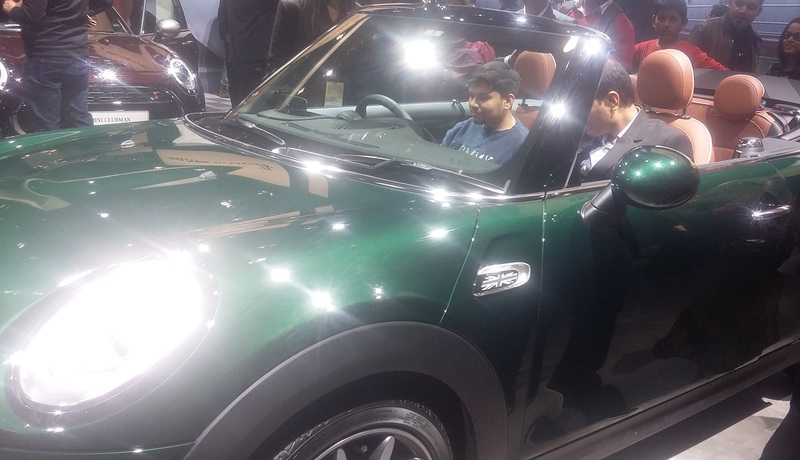 A long and harrowing journey to the venue from Delhi, yet people visited the Auto show with family and Kids. If you have not yet visited, here is a glimpse of some of the cars at the venue. Toyota I-Read, a futuristic gearless car with one seat. Two wheels in front and on in the rear. Myself, Dr. Renji George Amballoor is a non resident Keralite (NRK), currently associated as Associate Professor & HoD, Department of Economics, with Government College, Quepem, Goa, for last 26 years. Has a Doctorate degree in Economics from M G University, Kottayam and an Executive MBA from Goa Institute of Management (GIM). Was appointed as the officiating principal of a start-up Government College for setting up the institution. I am also the recipient of the D D Kosambi Research Fellowship-2013 ( Sr. Category) awarded by Department of Art & Culture, Govt. of Goa & Dempo Research Fellowship- 2008 awarded by Vasantrao Dempo Education & Research Foundation, Goa. What is the book about; and how did you start writing the book? In all the stories, entrepreneurship grew out of their passion and dream to do something different. The book is about 24 first generation entrepreneurs of Goa for sectors from sectors like agriculture, dairy farming, hospitality, drama, music, health care, culture, artwork, waste management, industrial designing, manufacturing, corporate training, information enabled services, etc. None of them had any family background in business. In all the stories, entrepreneurship grew out of their passion and dream to do something different. Their underlying philosophy is that of determination, positive attitude, simplicity and creativity. The narratives of almost all of them highlight the need for creative out-of the box thinking for transforming their challenges into new business opportunities. The objective of this book is to motivate and infuse students and youth into a culture of entrepreneurship & start-ups with local stories from their catchment areas. After interacting with most of the students, who were first time learners, as the officiating principal of a start-up Government College, I felt the need for pushing them into the mainstream. Internship programme was something close to my heart and decided to implement it. It was easy assignment to convince the students into internship but the stumbling block was their parents. Their argument was that their ward had to travel additional 10 to 15 kms to avail the internship. The dissenting parents were made the champions of internship programme by identifying and narrating the local success stories. In a short period of five years, I had lot of stories to entertain the parents. With these stories in my inventory, I felt the need for documenting these stories for deeper penetration and wider reach. My target audience includes students and youth who generally queue up in front of government offices, industrial estates and foreign embassies. Many a times, they end up being employed at places, institutions and departments with no scope for expressing their creativity. By introducing them into the world of start-ups and entrepreneurship, the optimal utilization of demographic dividend can be ensured. Give an example of one of the entrepreneurs from this book? Stories of all the 24 first generation entrepreneurs are interesting but the outstanding among them is that of Late Prashant Shinde. After securing a Diploma in Production, joined Pentair as an engineer, but his aim was to go to US. But his dreams were shattered with India test firing the Pokhran-II nuclear bomb. Many times, he would be the delivery boy riding on the two-wheeler. As time passed by, he had clientele including Trans-National Corporation and today provides livelihood to about 54 families. Disappointed at the turn of the events, he decided to do something of his own. Along with his friend Supriya, who later on became his life partner, carried out an extensive market survey and zeroed in on packaging industry but both were clueless about the sector. Prashant took a train to Dharavi, which had lot of informal packaging unit. He got employed in one of them as helper with an objective of mastering the machinery and its process. Impressed by his enthusiasm and efficiency, the owner of the unit made him an operator. After spending six months in Dharavi, he returned back with rich experience and exposure. With a small bank loan, he purchased machinery but had to search for about 3 months to get a place to install it. Along with his assistant, he started taking labour jobs for other printing units. Many times, he would be the delivery boy riding on the two-wheeler. As time passed by, he had clientele including Trans-National Corporation and today provides livelihood to about 54 families. He later became the president of Verna Industries Association, a period during which the infrastructural facilities expanded in the industrial estate. He was also instrumental in organising the first edition of business idea contest- ‘Kaun Banega Udyogpati’. He became a star campaigner for entrepreneurship awareness programme in colleges. His energy and dynamism would force students to wake from their deep slumber and on many occasions, he was asked to continue speaking which always extended into a standing ovation. He had also expanded his business into areas like real estate, mining, etc. He had to wind up his dream project of constructing a low-income housing township. Without remaining disappointed, he continued his entrepreneurial journey with greater vigour and determination. While celebrating his 38th birthday, he had a massive heart attack and the state of Goa lost a champion of entrepreneurship. Today, his legacy is carried forward by his wife Supriya Shinde. Did they all begin their venture before the beginning of start-up culture in India? The 24 entrepreneurs in my book started their entrepreneurial journey even before the winds of start-up culture could be felt. They started at a time when the thinking was orthodox and the society did not accept entrepreneurship as a viable source of employment. What is the situation of start-up culture in Goa? The start-up culture is slowly building up in Goa but the eco-system needs to be more conducive. The start-up culture which is getting popular in professional colleges should percolate into conventional non-professional campuses. The schools should include success stories of entrepreneurs along with chapters on Saints, Scientists, Social Reformers & Political Leaders for inculcating the values of entrepreneurship from early ages. The establishment of Centre for Incubation & Business Acceleration (CIBA) at two locations, BITS Pilani Campus in Goa, Goa Engineering College & Goa Information Technology Innovation Centre (GITS) have enhanced and nurtured the incubation facilities in Goa especially for the IT sector. Policy reforms needs to be made to ensure our academic process and faculty are more start-up friendly. Incentive system and mentoring facility needs to be built in to our curriculum for attracting students into start-ups. What is the future of start-ups globally & particularly in India? According to the Economic Survey released in 2016, India has 19,000 technology enabled start-ups. The future of start-ups is bright in India. With a population of more than one billion, the opportunities for start-ups are many. Over the census period, the rate of urbanization has skyrocket. With the increasing urbanization, problems have also witnessed an amoebic expansion. Problems needs solutions and this opens the floodgates of opportunities for start-ups. The captains of the industry should come forward to mentor and guide start-ups into sustainable take-off. Further, it has become a craze among youngsters to tell that they are into start-ups without any tangible outcomes. Such a trend is also dangerous. The global slowdown can actually boost the start-ups. With low and negative economic growth in many countries, the consumers are giving up their costly life style and looking for alternatives. The surge for options can fuel the start-ups globally. You are the principal of a start-up college, a start-up writer writing about start-up and published by a start-up publishing? Was it a coincidence? After interacting with most of the students, who were first time learners, as the officiating principal of a start-up Government College, I felt the need for pushing them into the mainstream. Internship programme was something close to my heart and decided to implement it. It was easy assignment to convince the students into internship but the stumbling block was their parents. Their argument was that their ward had to travel additional 10 to 15 kms to avail the internship. The dissenting parents were made the champions of internship programme by identifying and narrating the local success stories. In a short period of five years, I had lot of stories to entertain the parents. At that point I felt the need of documenting them for reaching a wider audience and in the process became a start-up writer. Very soon, I realized that these stories were about how the entrepreneurs made their start-ups sustainable. While scouting for a publisher, it was observed that their terms and conditions were unfavourable to start-up writers. A start-up writer is ignored, neglected and squeezed by established publishers. At home, almost every day we used to discuss my interactions with the entrepreneurs, their business model, problems, creative solutions, etc. Excited about the stories, my son decided to publish my book through his start-up – Rean Publication. At the end of this journey, I strongly feel that it is a mere coincidence that the entire assignment revolved around start-ups. The joy, satisfaction and a new identity emerging from writing the book is great. Writing takes one into a new world of networks and challenges. Writing this book was a part of my academic social responsibility to the state of Goa and its institutions which has showered me with opportunities and nurtured me into what I am today. As a part of giving back to the society, my next venture will be to document the first time women entrepreneurs of Goa. You might know children with cerebral palsy, who is the child of your friend, relative or a neighbour, who is bed ridden and you sympathise with the family which is taking care of the child. Nadia could have ended up simply lying in a corner of her house had it not been for the determination of her parent and the will power of Nadia herself. Her parents ensured that she studied in a regular school with her 9 siblings, for which they had to change locations. Nadia Clarke has cerebral palsy and she is deaf from her birth. At the age of 5, she got a wheelchair and a communication aid implanted on that. Her communication aid is her voice which she uses to communicate. Using the communicative aid is not easy. When she is talking to someone, her support staff communicates to her using signs. Then she makes sentence using the communication aid. Her communication aid consist of hundreds of words. It takes couple of minutes for Nadia to form a simple sentence. The process of communicating with the aid is lot of hard work for Naida and her support staff, and sometimes a bit boring for the listeners because of the long gap in between the communication. But that doesn’t stop Nadia from communicating and globe trotting. The Guardian Newspaper describes Nadia’s mother as someone with turbo energy which she has passed on to her children. Her parent were determined that she studied in a normal school, hence they had to shift to different localities to send Nadia to schools that accepted her along with her brothers and sisters. Nadia completed high school and level 2 in health and social care. Here next aim is to attend the university. Nadia has got indomitable spirit and she is supported by an organisation 1 voice. She has travelled around the world to Europe, US, Asia, Australia, etc. She blogs about all her experiences in her blog. One of her dream destination was India, and so now she was in India and she is quiet excited to visit Taj Mahal. When she came to India she visited Anchal-Centre for differently abled children. She interacted with the children and their parents using her communication aid and her interpreters Samantha Jayne Green and Tanya Louise Perry. Sibi, a student of Anchal refused at first to dance because she thought her costume was too long and she might fall. But the teachers and parents convinced her to dance. Before leaving Aanchal Nadia called Sibi and congratulated her for being so brave to overcome the obstacle. Nadia is all smiles always from her childhood picture upto now. She goes around the world and encourages children like her to move ahead in life and to explore opportunities. She says her biggest gift in life was the communication aid. She says for deaf and dumb people the aid protects them from abusers, because they can always communicate. When asked about the secret of her evergreen smile she said that her mother told her to wake up with a smile and to remain positve always. UnBox 2019 was a weekend of discovery and learning, and allowed for unanswered questions as well as explorations. It brought together emerging and disruptive ideas from those who are pushing boundaries of their own practice. The three day festival had 100 Indian Collaborators and 32 International Collaborators. Stories, conversations, and dialogues took centre stage at UnBox Festival this year touching upon relevant topics shaping contemporary thought. Day one was loaded with talks on water resource management at the grassroots, cultures and values of learning in the present age, the importance of consent in the digital space, exploring technology for conservation, the impact of social media on India’s upcoming general elections, as well as exploring the messy futures space from a personal and human perspective. Conversations on the burgeoning city limits and its impact on infrastructure and resources, storytelling traditions that share genealogies and ecological patterns, ethics that may govern the use of AI systems, the impact of technology in the social sector, making a truly inclusive Internet, design-led innovation strategies, the need for intersectionality in design and the use of digital processes in preserving heritage, unfolded and expanded through the three days of the festival. UnBox 2019 curated a set of workshops conducted by experts from varied practices, for festival attendees to participate and immerse into. While some created intimate spaces to brainstorm and ideate, others got participants down to their hands and knees exploring and making. Taking on multiple tracks and formats, they led participants to experience disability to understand its needs and choices, explored emerging technologies, create a wishlist of a feminist Internet, build unique conspiracies, imagine a world of AR/VR without using it, and discussed the role of technology in craft practices. UnBox also curated workshops that used three-dimensional tensile structures to evaluate the relationships of the human body, and featured the unheard stories of the brave women of Karnataka, explored the future of consent, examined data driven investigation, and making zines. The festival also hosted a 4-day lab, in partnership with UK-based artists collective – Invisible Flock, that focused on building meaningful, cross-disciplinary collaborations within environmental and socially engaged practices. It brought together artists, designers and writers from India, Uk & Uganda to think about technology beyond its traditional understanding, and instead as a creative medium. Outcomes from the Lab were shared in multiple formats ranging from exhibits to talks and performances. UnBox Food Lab explores connections and meaningful interactions between food, its preparation, the act of enjoying it, and the people who consume it. This year the lab manifested in the form of talks, workshops, and communal meals at the festival, with conversations on cultural appropriation in food and the future of urban farming; workshops that investigated the fascinating world of coffee through games, experience traditional fermentation processes, and explore our interconnected food ecosystems. A selection of films explored the challenges of rising food demands, while thematic culinary experiences translated into community meals that served traditional regional recipes and helped reconnect with those that grow our food. The evenings brought together an eclectic mix of sound and visual artists. A transmedia narrative using improvised electronica and live visual programming, featured Seasonal Affected Beats, Aural Eye and Cursorama came together in Dreamswitch at the UnBox Open House on day one of the festival. UnBox After Dark was a collaborative audio-visual showcase by UnBox residents and guests at Foxtrot, Koramangala. The night combined sounds from Bombay based electronic musicians SPRYK and Echofloat, with visual interpretations from Thiruda and Cursorama from the VJing collective Alt-Q, supported by Romanian collective Aural Eye Visions Studio. The last evening of the festival brought together an indie folk trio with Abhijeet Tambe accompanied by Michael Dias and Kaushik Kumar in The Unwind Collection, at The Humming Tree in Indira Nagar. This was followed by a modern, electronic set that brought together the sound experiments of Nikhil Narendra and Shreyas Dipali. The exhibits at UnBox transformed the space of the festival into a transient gallery with projects and ideas across multiple formats. More than 18 installations and exhibitions were presented that ranged from immersive entertainment with VR film pods to a participatory installation on creating a collective scent. Others included the outcomes of mixing environmental data collection with technology, a curated set of albums that created an archive of stories from India’s countryside, an interactive installation that made visual and acoustic connections between outer space and physical spaces that surround us, and the making of both real and virtual Narkasur effigies. Music came alive through the stories of a curious crow that lit up each time a musical note played, and a transient space within an auto rickshaw that urged all to make their own music. Like the past editions of UnBox festival, this year the line up for day one was stacked with some great talks, panel discussions, workshops, exhibitions, installations and meals. Festival attendees got a chance to explore talks and panels on water-related issues, the future of urban farming, the digital content landscape in India, language and learning, the impact of social media on the upcoming general elections, building resilience from distress and tech ecologies. Produced by UnBox Food Labs, lunch at the festival was catered by Bengaluru Oota Company which was a tribute to the Gowda and Mangalorean cuisines of Karnataka, a culinary experience based on heirloom family recipes that are passed down through the generations. Post lunch, we dived right into workshops – Experiential Immersion in Disability, The future of History, Smellscape, Emergent Tech, What is your feminist wishlist?, Narkasur, Conspiracy creation and Seeing Invisibility. UnBox X Open house – a free for all event kicked off at 6PM with Now: A Kinetic Life – an interactive installation and performance, and a three-part film addressing the challenges of rising food demands. A collection of art exhibits, installations, screenings and immersive experiences were on display and open for all those who walked through the fest. We closed day one with a trans-media narrative of hypnagogic dreamscapes (titled Dreamswitch) through improvised electronica and live visual programming, featuring Seasonal Affected Beats, Aural Eye and Cursorama. As reported by Vibhuti Jaswal from the festival venue. Information about the Evening Performances On February 16th and 17th. Aural Eye X Cursorama X Echofloat X SPRYKPresented at Foxtrot – House of Subculture in Koramangala. Unbox After Dark presents a collaborative Audio Visual showcase by the Unbox residents and guests. The night combines sounds from Bombay based electronic musicians SPRYK and Echofloat, with visual interpretations from Thiruda and Cursorama from the VJing collective, Alt-Q supported by Romanian collective- Aural Eye Visions Studio. Spryk is the brainchild of Tejas Nair, an independent electronic musician pushing boundaries of technology-driven art. EchoFloat is a music project conceived by Jeff Nelson, exploring productions and DJ sets ranging from lush thoughtful soundscapes to intricate granular textures, to invoke a sense of space, form, interconnectivity and movement. Presented at The Humming Tree in Indira Nagar. Tambe & Friends is an indie folk trio based out of Bangalore, India. The project revolves around an intimate collection of songs written and sung by Abhi Tambe with ample support from Michael Dias and Kaushik Kumar on guitars and vocal harmonies. Abhi Tambe, currently performing as a solo singer-songwriter, is remembered in the city as one of the founding members of the cult band Lounge Piranha, which disbanded back in 2010. Michael Dias is founder and frontman for current city favourites Mad Orange Fireworks and Kaushik Kumar plays bass in the same band. They will be followed by a modern, electronic set that brings together the sound experiments of Nikhil Narendra and Shreyas Dipali. They used to perform with alternative band The Bicycle Days, but have found their true calling in electronic music that condenses their many influences into one sound. When you invited me on The Blind Date I was puzzled. Should I accept the invite or not. How could I go on a blind date with The World, which never happened so far in history? Those who travelled the world, they travelled with a purpose. The Vikings were pirates. Columbus and Vasco de Gama sailed in search of the spices. The three Magi followed a new star in search of the newborn and the Israelites crossed the Red Sea to settle in the land flowing with milk and honey. Lord Hanuman went in search of Sanjeevani. There are many fictional places, in novels. Alice falls into a hole and discovers a Wonderland. Gulliver lands in Lilliput. There are other famous fictitious places like Erewhon and Utopia. The boy in ‘The Alchemist’. He had a dream and sets out in search of a treasure. And what a fantasy-filled, mystic journey it was. Was it you, The World, who came in his dream and cajoled him to go on a blind date on paths unprecedented. I was just joking. I know these places are just in fantasy and they do not exist in reality…… Or do they exist somewhere? The World, you are too tricky. The mankind is yet to unravel you completely. Can you just spot one person who has been on a blind date with you? Not even Otzi, the Iceman. He was out on a mission, probably a soldier, killed in action and preserved for posterity by you. Were the Mountaineers, who discovered, Otzi, 6000 years later, on a blind date with you? I got ‘My World’. A world comprising the people I know; the world that I read; and the world of my dreams, aspirations and hope. What I see and hear and whatever I fantasy they become part of my world. And the world that I have not seen, heard or experienced is your world. Do you have anything to offer me on the blind date which is not already part of my world? You are a little late, I have seen it all. What I want to see are all over the Media. The television and the social media takes me to the unseen world. I have seen the underwaters, the deep forests and the Outer space. There is nowhere in this world where you can take and surprise me. Since I am not a big fan of surprises, let us reach an agreement. I will let you know my bucket list of places I want to visit. And I will share with you my likes and dislikes; and my dreams and wishes. You will have a fair idea on how to plan the blind date. I don’t like group tours. I like to travel with friends or family in a small group. Even if I can visit only a few places it is Ok. I want to tap the essence of the places that I visit. I want to meet the local people. Have food with them and enjoy a few cultural events. If you go for a group tour, they take you to popular destinations and the tour is time bound. The popular tourist places are mostly customised – a dream world which is a bit away from reality. I would like to visit a normal family in any place and eat what they eat normally and enjoy the cultural activities they enjoy normally. That is the real culture of a place. Remember, Abhilash Tomy, who sailed solo. He met with an accident at a remote location in the Indian Ocean. A location unexplored by mankind. Even now there are places on earth, unexplored. You still have many surprises for us in your kitty. You have many places still secretly kept and yet to be unfolded to mankind. Are you planning to take me to one such undiscovered place? Then I am ready for the blind date. Maybe I can meet people there who have their tradition, customs and recipes original and fresh. I want to visit the Holy Land so as to tour all the places mentioned in the Bible. Do you have any Biblical places which are not known to the people? Then please take me there on our blind date. Can you take me to see the golden Daffodils and the lonely moor where the leech gather worked dedicatedly? Those are perfect places for a blind date. We can read the romantic poems of Wordsworth and pluck a few golden daffodils as a memento. The biggest attraction of FIFA 2018 was Iceland. The highest temperature of the country is 25-degrees Centigrade and that happens rarely. The average temperature is 12-degrees Centigrade. How Cool! Can you take me on a blind date to Iceland? I saw the images of Iceland. Auroras, glaciers, blue lagoons and much more. Do you have anything to offer me in Iceland which is unexplored by man? Off late there is growing interest in European tours. Some countries in Europe like Croatia, Czech Republic and Greece are becoming favourite tourist destinations. European countries that were known for modernism are now searching for their tradition. They are exhibiting the traditions from the past. Can you help me discover one of the forgotten traditions of Europe on our blind date? I want to visit The United States because everyone who goes there never wants to return. I want to see why the country in so attractive. Everyone knows everything about The United States. But still you, The World, may have something hidden to surprise me on our blind date. I am sorry if I disappointed you. I am such a fuzzy person. You will take me on a blind date and we will end up arguing. So I just made my stand clear. I like to keep my world pure and pristine. Crystal clear like Diamond. Every place I visit, every person I meet, every story I hear and every food I eat becomes part of my World. I am sure you will understand my likes and dislikes and plan accordingly. I am waiting with excitement to go on the blind date with you. After all who can be a better companion to travel the world than you, The World. Hope that after this blind date my World encompasses the whole of The World. I know you won’t reveal the whole world to me. You will still have some hidden surprises so that you unravel The World, during Blind Dates, to the mankind in thousands of years to come.